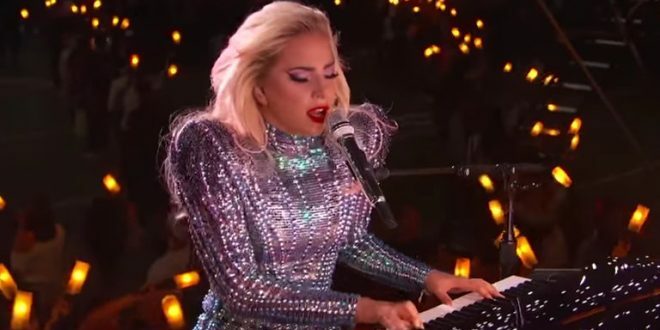 Lady Gaga Earns Raves For Super Bowl Show [VIDEO] - Joe.My.God. Lady Gaga thought she’d drop in on Super Bowl LI Sunday night. Literally. The retractable roof at NRG Stadium opened up so the singer could make a Spider-Man-like appearance, leaping from the roof to the stage below. Before making the impressive jump, she performed a brief patriotic medley, singing bits of “God Bless America” and “This Land Is Your Land,” and quoting the Pledge of Allegiance. Gaga was backed not just by dancers and singers, but by 300 lit-up drones that shone like stars in the night sky. Gaga started the show in a glittery bodysuit, later adding a gold jacket with spiked shoulders, then stripping down to football shoulder pads, a bare belly and sparkly shorts. Most reviews point to Gaga’s opening incorporation of Woody Guthrie’s protest song, This Land Is Your Land, as a nod to Trump protesters, who have sung it at recent events.